Barrett Lindsay-Steiner, renowned as one of the San Francisco Bay Area's best directors of children's theatre, began directing his summer programs many years ago... His program, now known as Standing Ovations, is widely respected as the East Bay's best children's theatre, and consists of both his famous 3-week intensive summer camps and semester-long school year programs. 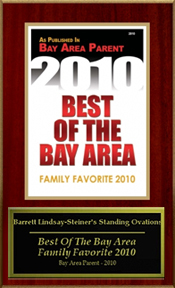 Recently, Standing Ovations was named "Best of the Bay Area" in Bay Area Parent Magazine, another testament to how much Bay Area familes love Barrett's programs for young actors! With a curriculum combining acting skills, leadership, dance and movement, teamwork, and character development, there's no question as to why Barrett's program consistently has waiting lists. Standing Ovations Theater Camps and School Year Programs offer musical comedy training to elementary, middle school, and early high school children and teens. Barrett and his staff instruct students in a warm, supportive environment, inspiring self-confidence and building self-esteem. His camps and classes havelow student-staff ratios, and the staff members themselves are often alumni of Barrett's camps and are now young professionals in the entertainment world. Each program's culminating performance is funny and witty, with books, music, and lyrics always by Barrett himself. He also accompanies every one of his shows. And one more thing can definitely be guaranteed:your child will want to come back year after year. And by the way --- No Experience is Necessary! Barrett's theater arts programs for children have been profiled in "Diablo Magazine" & the "San Francisco Chronicle". Also, check out these other articles and reviews about Barrett Lindsay-Steiner.